Is the wedding within a month of an interstate move/new job/new house/all of the above? Is the wedding within one week of a major conference deadline? How many flights will I have to take to get there, and how many children will I be the sole guardian of on those flights? Doesn’t matter, really. 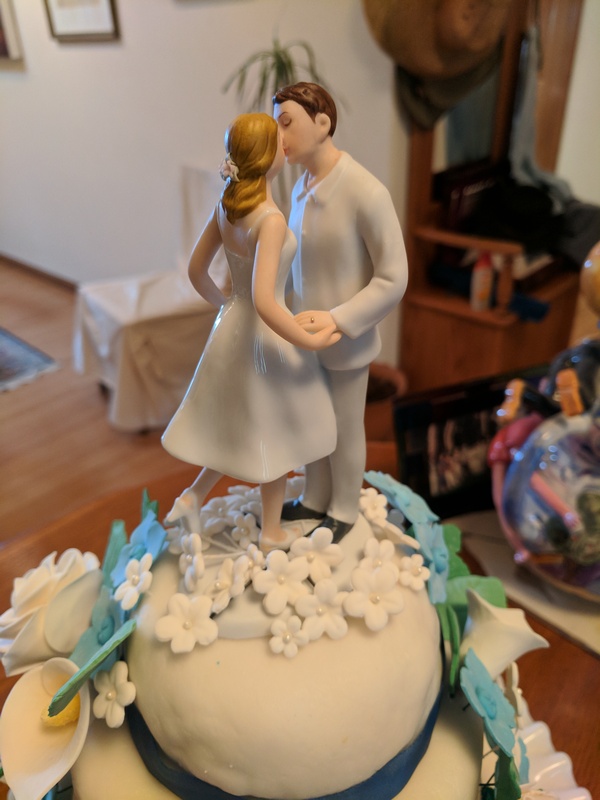 My sister-in-law and great friend was getting married, and I was so excited to make her cake. It just ended up being slightly more complicated than I expected. 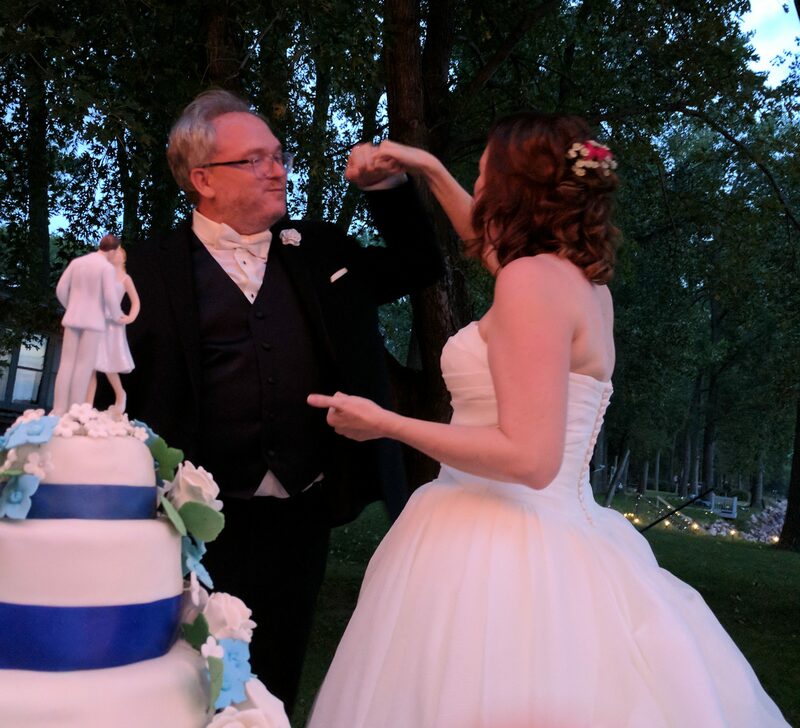 I didn’t tell the bride this, but for a while there was serious concern whether my cake pans had actually made the move from Chicago to Pittsburgh. I couldn’t find them. I couldn’t find anything. Turns out I cleverly stacked them inside the cake carrier to save space. Should have written that one down. We also hadn’t moved much food, of course, so I had to buy a whole lot of supplies, which means the customer tracking on my new loyalty card at the local grocery chain will forever think I need sufficient coupons to sustain my consumption of roughly 8 pounds of sugar per week. 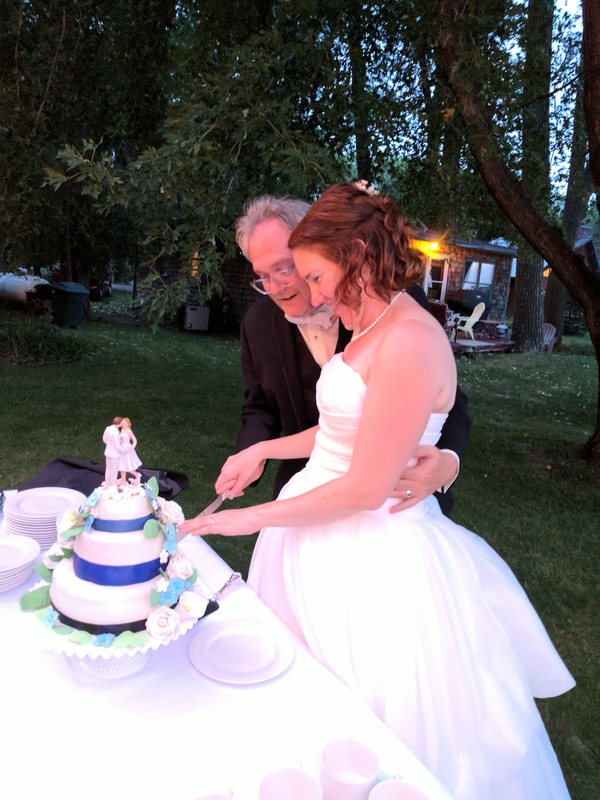 On top of having my whole kitchen boxed up and my pantry depleted, I had a hard deadline for a big conference the Tuesday before the wedding, andI was solo parenting all week because my husband was still in Chicago finishing out his two week’s notice on his old job. 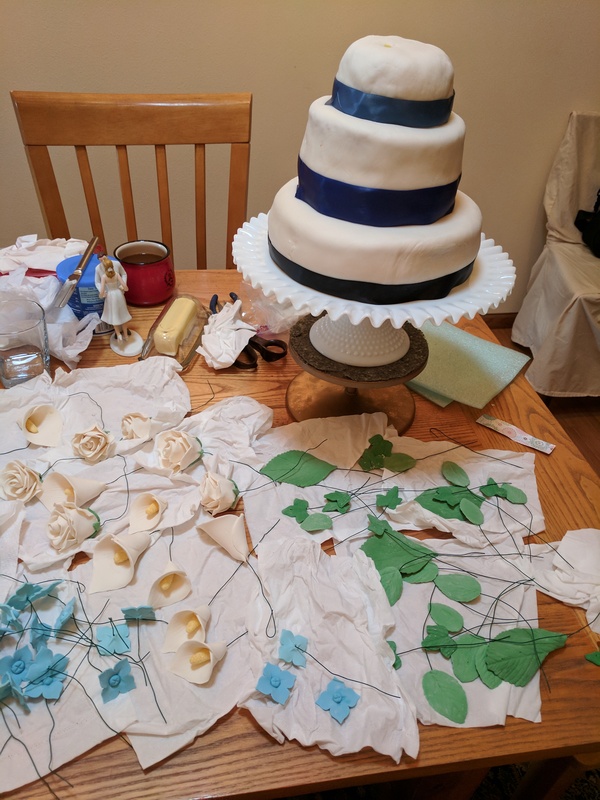 So strictly speaking I didn’t really have time to craft all the gum paste flowers for the floral spray design the bride and I agreed on, but on the other hand, making them is incredibly satisfying and even therapeutic. The gum paste roses and calla lilies needed to hang to dry. Seen here before they started dropping from their own weight and crashing to the counter below. The wedding was in South Dakota. I was in Pittsburgh. There wouldn’t be time to bake it there, which meant I needed to get it there, and there aren’t any direct flights. So 4 tiers of wedding cake on two planes, with two kids and their car seats and luggage and all that. On paper this should all work out fine, assuming the TSA agents I encountered were up on the letter of the law. I knew the best chance of the layers surviving intact was if they started frozen. 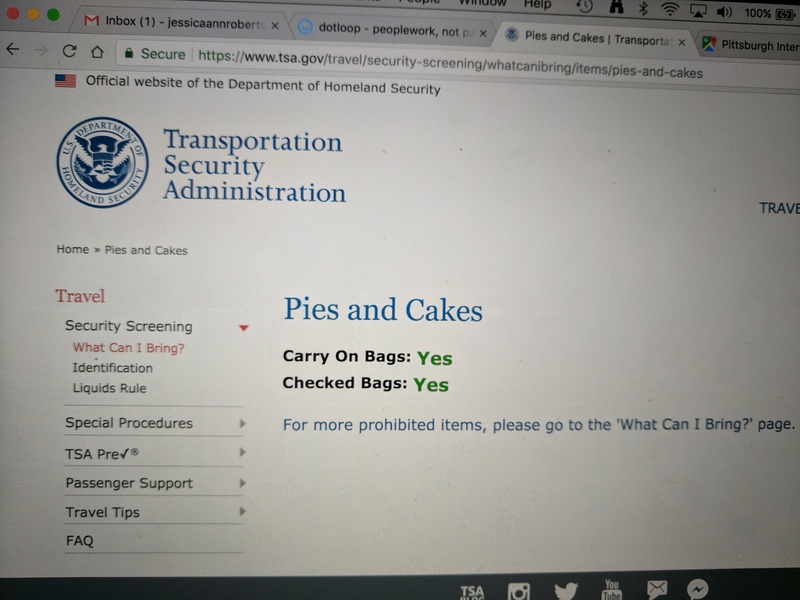 (This also means they would be entirely solid when going through security and therefore the frosting wouldn’t get labeled a liquid and rejected.) I stuffed styrofoam inside the lining of my suitcase to insulate as best as possible, and packed three of the layers in tightly, so they wouldn’t jostle too much in case for some reason I ended up having to check the bag. The fourth layer I had to add to my soft-sided cooler, along with snacks for the kids. 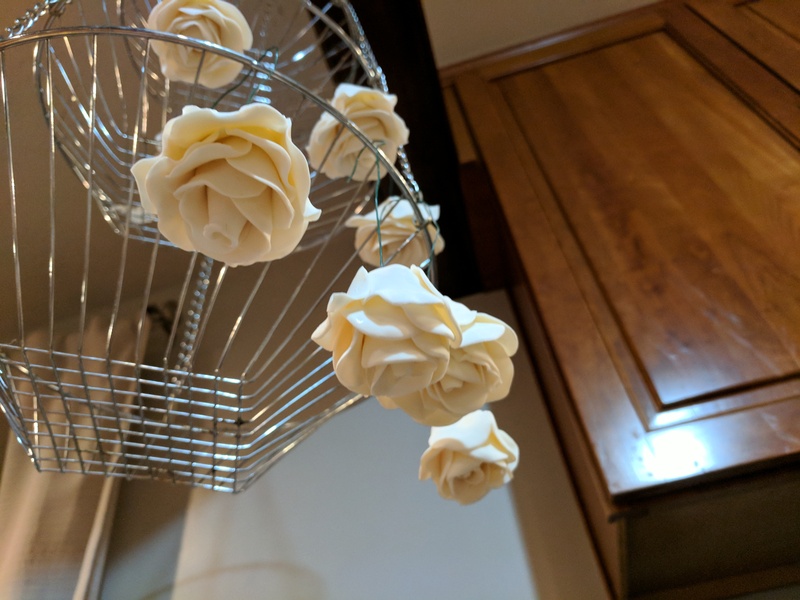 I shipped the gum paste flowers ahead, since bringing a bunch of putty-looking things with wires sticking out through airport security definitely didn’t seem like a good idea. Everything made it fine. A few of the flowers had cracked, and one of the cake layers was a bit smushed and needed to be coaxed back into shape. And it turned out the sizes of cake layers I made didn’t look right together, so I left one of the layers off and served it on the side. 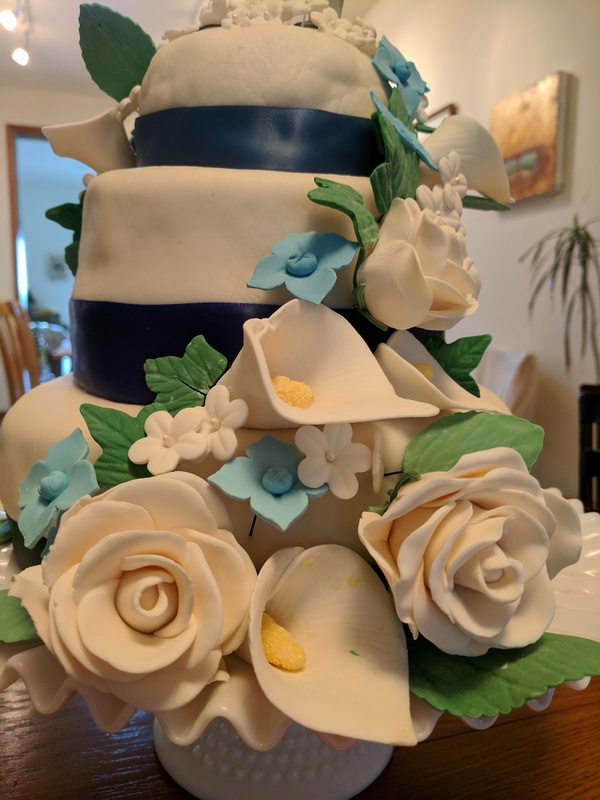 I laid out all of the supplies and just started pushing flowers in until it looked nice, with one spray of flowers going up each side of the cake. Plus a whole lot of little flowers on top to hide the thick wires strapping on the very heavy porcelain topper they’d chosen. The happy couple appreciated it. And it took me one full year to finish this post. Happy anniversary, Ellen and Mark!